by excellent photos, the lessons take us through all of the steps of this "not difficult but labor-intensive"
Doing The Block - There is a long tradition and a high level of interest in patchwork quilting in Australia, going all the way back to when the colony was first founded. 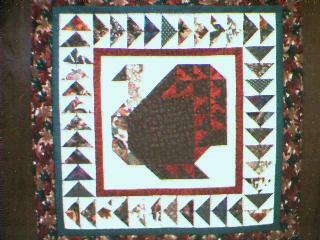 Australian quilters are also very active on the internet, and have established several websites displaying their work. Jeanette Holkner of Melbourne has erected a very creative site called "Doing the Block," which neatly links quilting with the history and architecture of that Australian city. This page features Jeanette's quilts as well as her collection of antique sewing machines, while sharing with us her knowledge of her city's decorative tradition. There are also links to other Australian sites. The Electric Quilt Company - The Electric Quilt Company, maker of the well-known quilt design software, has erected a suite of pages in support of its products. Instead of a boring recitation of the virtues of EQ3 and BlockBase, however, this site has some neat features which display the characteristic playfulness and sense of humor that can be seen in their software tutorials and elsewhere. PC Piecers - PC Piecers is more than a website -- it's a community. Visitors can join swaps and trade ideas with this high-energy group. Quilt Biz - The site is graced with QuiltBiz co-owner Mary Graham's delicate and colorful artwork and the content features information about the many companies who have chosen to become QuiltBiz associates. A gallery of web-page art is available to associates. Quilt Gallery - Created by Debra Weiss, who manages the Stitch Forum at the Microsoft Network, QuiltGallery is an online magazine aimed mainly at art quilters. It states its purpose as two-fold, to provide "solid information designed to inspire and intrigue," and, through its gallery, provide a marketplace for buyers and sellers of contemporary quilts. Judy Smith's Home Page - Judy's first passion is quilts, however, and featured on her pansy-bestrewn front page is an extensive list of quilting links that's worth a visit in and of itself. Other links take to you to a gallery of her own quilts and to the QuiltArt page, including the QuiltArt Gallery, where members' work is displayed. This site is a showcase for much of the best art quilt work being done in the world today.